McALLEN — Most coaches don’t receive an entire round of applause for walking out to the field for practice. But when Rowe boys soccer coach Manny Garcia entered the practice field Monday afternoon for the first day of practice, that was his welcoming. Because for the 53-year-old man who almost lost his life before the start of another soccer season, walking to the pitch under his own power was a massive step. The morning of Jan. 2, 2014 started like many before it for coach Manny Garcia. It was McAllen Rowe’s first scrimmage of the season and he was preparing to guide the Warriors against Brownsville Pace, who were then coached by his longtime friend Chico Jimenez. The two exchanged a text in the morning but by the afternoon, when Jimenez arrived to the McAllen campus with his bus full of players for the match, something was off. After waiting with his team for a while another coach finally broke the news to Jimenez. “You didn’t hear? Coach Garcia suffered a massive stroke,” a Rowe assistant told him. Disbelief was Jimenez’s first reaction for many reasons. Not only because he knew Garcia to be in excellent shape, but because they had spoken earlier that day. Garcia’s stroke happened two hours later. Carlos Arzate was a senior on the 2014 team. He remembers Jan. 2 from another perspective. Before that day, he said, he was an “immature 17-year-old kid” but after receiving the serious news about someone close to him, that faded away. Garcia’s brain aneurysm nearly took his life that winter. He was originally given slim odds to live, then his wife was told he might not be able to open one of his eyes again. Both of those things happened. The two have remained close since then, and the 2014 high school graduate is finishing up his education degree, hoping to follow his mentor’s footsteps as a coach. Almost five years have passed and Garcia is back to walking under his own power faster than his doctors expected. Not much about his rehab was easy, but in 2016 Doctors Hospital at Renaissance acquired an EksoGT Exoskeleton. The device is a robotic walker-like machine that can monitor the force exerted by the patient and either add or dial back assistance. DHR’s Vice President of Rehabilitation Services, Maritza Padilla, was at the school to watch him take the steps back toward his passion. Their device is one-of-a-kind in the area and played a big role in helping him to his feet sooner rather than later. Garcia was one of the first two to use the technology for stroke rehabilitation. He had his battles through rehab, but in the end was happy to have the help. 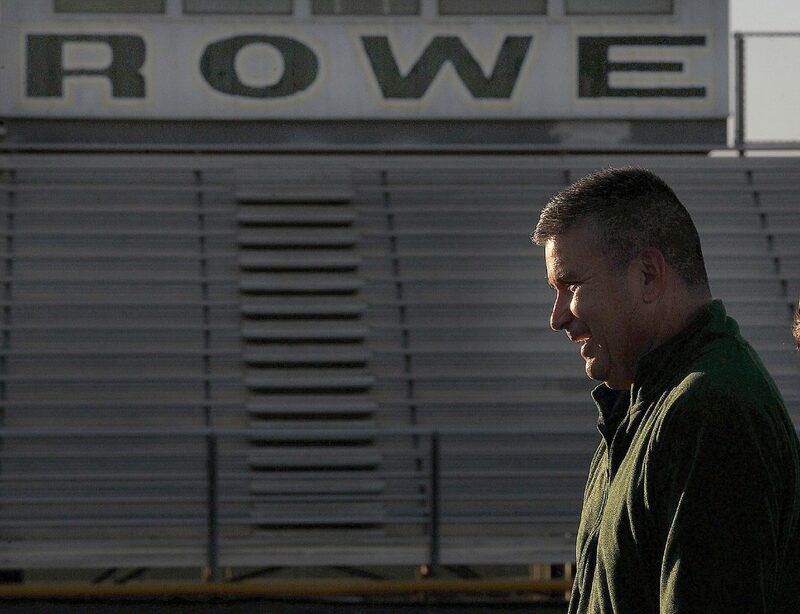 Garcia has been at Rowe since it opened as a four-year high school in 1992. His footprint of former players, turning into coaches is growing. Oscar Torres and John Martinez coach football in the fall, they both played for Garcia during some of the program’s brightest seasons. Martinez, head girls soccer coach, gave a few words before Garcia addressed the team for the first time this season. He played four years for Garcia before his graduation in 2003. Jimenez made the move to Brownsville and is now the boys head coach while Garcia is an assistant. The two work in tandem just a few years after the emergency struck on a day they were scheduled to coach against each other. Garcia is hoping to get back to his running shape. Former players let out groans when they talk about the running regimen the Warriors maintained. Garcia worked out as hard as his pupils. “I would take them all the way to four-mile line, 2.7 miles North of Rowe, but they can’t complain because I was right there with them,” Garcia said. “I’m going to hold them to that,” Garcia said.